To catch up on all the excitement, recap last week’s episode, HERE! From last week we know that Esther is not in Lenore’s body and ready to destroy Klaus and Elijah. We start off this week’s episode at Marcel’s place and his clan of vampires when all of a sudden they get intruders and a warning from the werewolves (under the control of witches) to leave town or else they will not hold back. Welcome to the “City of Death,” as Camil names it. We see the real tension between Elijah and Hayley and it is definitely not the same between them. Camil is seen on the phone with Davina and D tells her that she is ok and hangs up with her. 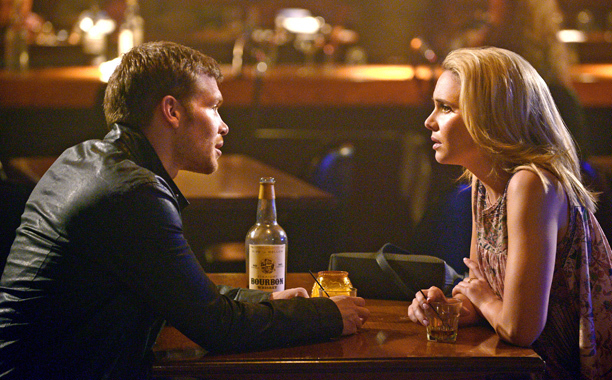 Cami then bumps into Klaus who has already figured out where Davina is just from overhearing the call with Camil. Next we see Esther with Kol, they are trying to locate Davina and are unsuccessful. Finn comes in and Esther tells them that they need to find Davina and the white oak stake. We go back to Davina with Mikael who tells her that they should not hide and that her weakness will be her fear. Finn, Oliver and a werewolf are in the cemetery and it seems like Finn has a plan to attack the vampires that involves a bunch of kids, killing and activating their curse. Back with Davina and Mikael, he is teaching her be strong, just what Davina wanted. He throws a stick at her and says, “Lesson 1, always be on your guard” just like Elijah had just said. They start to do some “training” but she twists her ankle and he tells her to get up. She is clearly hurt but again he tells her to get up and she does. Camil and Klaus are at a bar, against Klaus’ wishes he wants to hurry over to Davins’s but Camil wanted to get a drink and not be rushed to the “killing” that she expects to happen between him and Mikael. We switch to Davina and see that her ankle is swollen and she is in pain. She calls Kol, even though she doesn’t know who he truly is, and tells him that she will send him the address where she is at and a list of things that she can maybe bring her…oh no! Hahaha, oh Elijah! As he is training with the new vamp, she punches him and he says, “As a devout feminist I refuse to say you hit like a girl.” He’s so witty and charming and handsome and I love him. ❤ Ummm…what were we talking about? Oh yeah, so the training continues and she is getting better but some serious sexual tension happens with them as he tells her that nothing matters unless you go for the head or the heart and make the kill. He puts her hand on his chest and she digs in to grab the heart, but not to really kill him just so that she learns how to do it. As she has her hand in his chest Hayley walks in…with another werewolf who has something to tell Elijah. He tells him about Finn’s plan to use the kids and explains to them that one of kids is his little brother and doesn’t want him to die. We go back to the bar with Klaus and Camil who keep talking and then she asks him to dance. There is more sexual tension between them and as you think something, like a kiss, will happen between them he spins her and leaves. Kol is now with Davina and has mended her ankle. He asks her what she is doing there and she still doesn’t trust her but daaang is he so smooth and charming that it is hard not to trust him and maybe tell him the truth. So now Elijah, Marcel, Oliver and the werewolf with Hayley are making a plan to stop Finn and fight against Esther. Oliver is a little worried but Elijah tells him this is their only chance. Now Kol is still at Davina’s and starts snooping after she falls asleep. He looks around and finds the white stake. He goes to grab it and Mikael grabs his arm. Kol tells him that he can free him, that he knows the spell to have him unlinked to Davina and can help him if he lets him go, he eventually does. Does this mean they have a deal? So now the New Orleans festivities have begun with all the children. Marcel and the gang are ready to take their plan into action and free the kids. Oliver goes back to Elijah after he and Hayley had led the kids to a safe place. Elijah and Oliver get surrounded by a group of witches or werewolves, [it’s hard to know who is who these days when they are all working together]. Elijah tells them that the children are not there and he says they don’t want them they want Elijah because Esther wants him. So Oliver & Elijah then kill all the people and they think they are done. But then comes Finn who stabs him with a stake and Esther appears. Ahhh! LEAVE HIM ALONE! Davina wakes up to Kol telling her that she has a bunch of texts from Cami, she reads them and it says that Klaus knows where she is and is coming for her. She grabs Kol and they start doing a spell together to hide them just as Mikael is seen standing holds the white stake. Klaus sees nothing inside the house and decides to leave but then goes back to find the big stick that he knows is his dad’s. He throws it inside the house and they get surprised which makes Davina accidentally hit her head on the table and knock herself unconscious. Mikael tells Kol that he better release him or he will kill him. He performs the spell and now Mikael is free and walks outside to meet Klaus. They start to fight and things get intense! Klaus knocks the stake out of his hand but then Mikael grabs it and stabs Klaus but Klaus stabs him with one as well. Klaus stands over him watching him in pain as Cami runs in and tells him that he cannot harm Davina and he gives her his word. Marcel, Hayley and the new vamp are all hanging out, proud to have accomplished what they did and the vamp tells Hayley she is worried about Elijah. Hayles tells her that Elijah can take care of himself and not to worry, but maybe they should. We then see Klaus put his dad in the trunk but Mikael wakes up and takes the stake out go his body, uh oh! We flash over to Elijah who wakes up after he was knocked unconscious by his mother and we see that he is chained up. The first thing he sees is Esther, she tells him that all she wants is to have her family back but first they must be purified and she leaves. Come back next week as we happily stare at Elijah and hope his crazy mother leaves them alone.